Use a homemade rub to make an absolutely delicious Mexican Pulled Pork recipe in your Instant Pot or pressure cooker. Make pulled Pork tacos, or use it for burritos, casseroles, or whatever other creative uses you can think up! Is Mexican pulled pork even a thing? Well, it is now! This is so easy and delicious for pork tacos. It’s nice to be able to make a batch of this and have it handy for tacos, tamales, or even just for snacking with some avocados and sour cream for a low carb snack. This is also an excellent cooking method to take a cheaper, more tough piece of meat and make it absolutely tender and delicious! 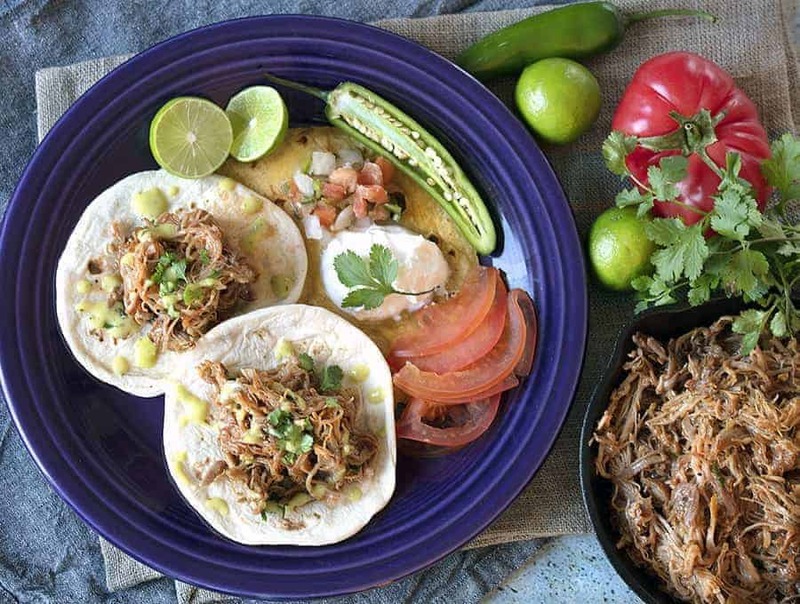 This Mexican Pulled Pork recipe shreds so easily and has the best flavor. The meat does NOT taste boiled, because it isn’t once you pressure cook. This is also SO much faster than cooking the old-fashioned way in your oven or slow-cooker. 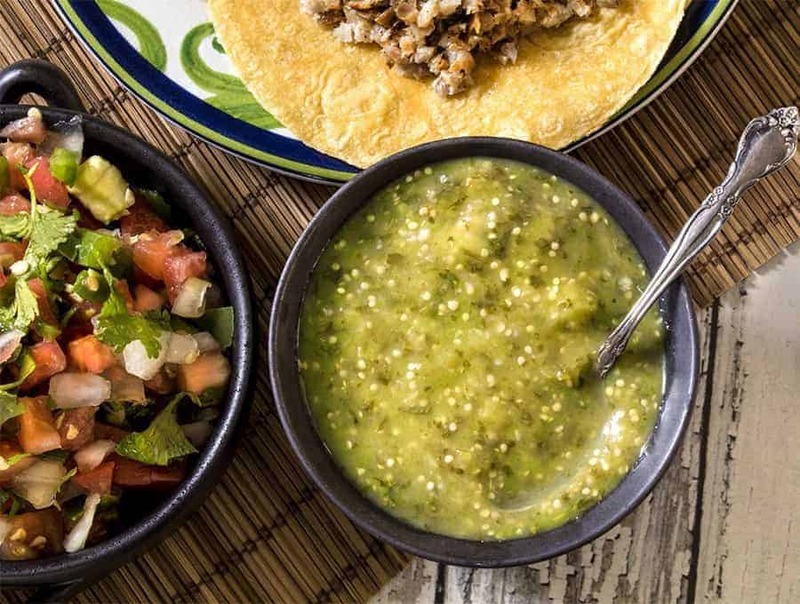 Something you should DEFINITELY make to pair with this dish is my Air Fried Tomatillo Salsa. It gives just the right amount of acidity to complement the dish perfectly. A great side dish option for this recipe is my Mexican Rice Recipe. 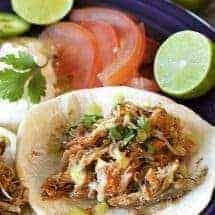 It’s super easy to make in your Instant Pot and is the prefect compliment to pulled pork tacos! 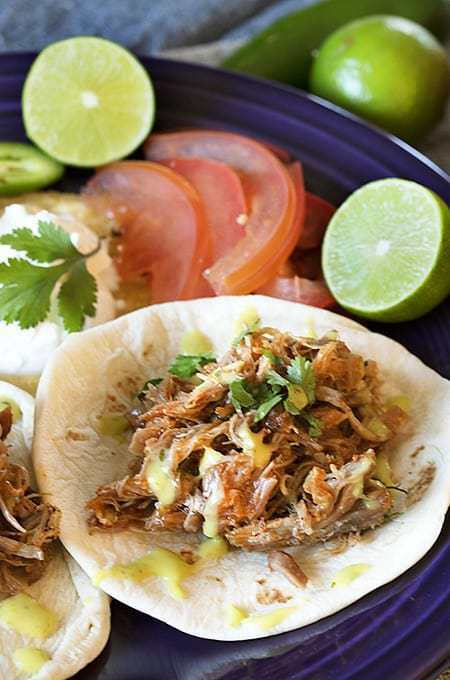 So whether you’re looking for taco Tuesday recipes, a great family meal idea or a nice low carb snack, this Mexican Pulled Pork recipe is sure to leave you full and satisfied! Thanks to you’re Instant Pot, it’s so easy to make that you might find yourself making this on a weekly basis! In a large bowl, mix together the brown sugar, garlic powder, onion powder, smoked paprika, salt, chile powder, and black pepper. Place the pork pieces into the inner liner of your Instant Pot. Add the ¼ cup of water. Cook on high pressure for 25 minutes and then let it sit undisturbed for 10 minutes. Release any remaining pressure. Shred the pork pieces and push back under the cooking liquid until ready to serve. Serve with optional taco fixings, as desired. Urvashi, this recipe was fantastic!! Thanks so much!! What is the serving size on these? Sounds amazing, but counting calories and need tube amount per serving if possible. .. Thanks! Made this tonight….super easy to come together. Hubby had it with tortillas and I put it on a bed of fresh spinach. We used various taco toppings like cilantro, jalapeño and pico de gallo. This will definitely be made again! Can you do this with chicken or beef instead? I also meant to say that I took the liquid after the meat was cooked and reduced it on the stove; it turned into a rich, delicious, unctuous sauce that we put over the meat. As I said, a great hit with the kids. Very easy, very tasty, very quick, very kid-friendly (without the chilli). looks delicious! can we sub chicken? what would be the cooking time for that?